If you entertain a lot during the summer, you can always use some help to make you event perfect. These five unique products are great for backyard entertaining. Have you ever been to a party where you had to stand to eat? The biggest problem is what to do with your drink. So many times I will put it down on a table and then within five minutes there are a bunch of other drinks around mine so I don't know who's is who's. 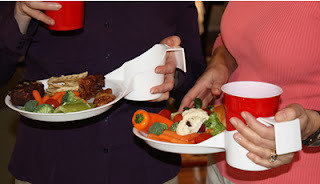 The Drink N' Plate is a combination of a plate and drink holder that can be held with one hand, allowing the entire meal to be carried conveniently and easily. 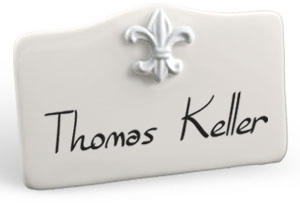 It is also reusable and dishwasher safe for easy cleaning. Great for a backyard cookout or even tailgating at a football game. $24 per pack of 8. Little Griddle is a line of heavy duty grill-top griddles that shatters all the conventional limits on cooking outside on your grill, allowing virtually anything to be cooked on any grill. 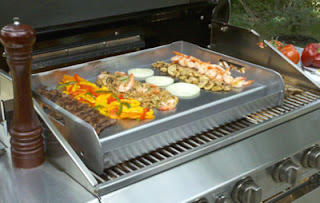 There is a Little Griddle to fit any shape or size grill, round or rectangular, large enough to cook meals like a breakfast of eggs, hash browns, bacon and pancakes, a lunch of Philly cheesesteaks or a dinner of the day's catch, stir fry, burgers with sautéed onions, and so forth. Griddle your salmon filets with your favorite seasonings; there is no need to wrap them in foil. You can even bake cookies and pizza on your grill. It cleans up easily right on the grill, no need to wash in kitchen sink. $69.99 - $449.99 depending on size. The Safety Turtle Wireless Wristband Alarm is an ingenious combination of wireless signal-outfitted wristband and a wireless base station receiver that sounds an alarm the instant a child falls or ventures into water. The base station can be positioned anywhere between pool/waterside and 200 feet away (depending on model desired). Base starts at $235. All thoughts and opinions are my own. I received free products in exchange for this write-up. The drink n plate, tiles and the wrist band are awesome products!! Love those ideas. That pool alarm is AWESOME!! Saw the spot on TV today - great job. Loved the patio lanterns too.